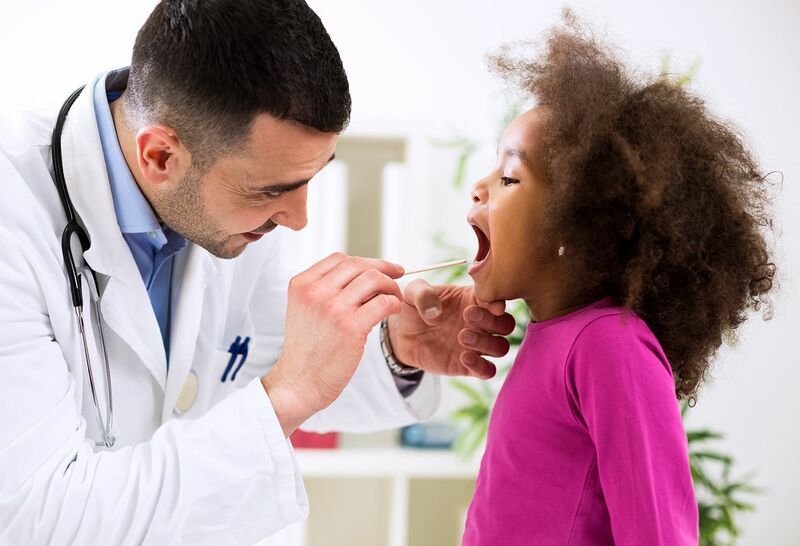 To find a pediatrician, call us or set an appointment. Dr. Minu George is a board-certified pediatrician and assistant professor at Donald and Barbara Zucker School of Medicine at Hofstra/Northwell. New parents love to celebrate all of those special baby “firsts”—the first smile, the first time she rolls over, sits up, and eventually walks! But as pediatricians, there’s another first that we consider particularly significant, and that’s your baby’s first checkup. Ideally, this inaugural visit to the pediatrician will not be the first time you’re meeting your baby’s doctor. It’s important for prospective parents to scope out various practices prior to having the baby. This way, you can meet with several pediatricians and find a practice and a doctor that you click with. This is a relatively intimate relationship, so it’s not something to be taken lightly. You really want to find someone that you trust. And ideally, the practice will also be nearby so that you can bring the baby in quickly if you need to. After you deliver, the hospital pediatrician will tell you when to bring the baby in for the first visit—that timing depends somewhat on the baby’s health status while in the hospital. In most cases, we want to see a baby in the office within the first 48 to 72 hours after discharge. If you’ve had a C-section, your baby has usually been in the hospital for three or four days, in which case we may give you a little more leeway because the baby has been observed and examined for several days in a row already. But if there were issues in the hospital, such as trouble with breastfeeding or jaundice, we’ll probably want to see your newborn a little sooner—probably within 24 hours after leaving the hospital. At that first visit, we’re mainly concerned with how baby is eating, pooping, peeing and sleeping. We want to know exactly what you’re feeding your baby; we want to make sure they are getting enough to eat, so we’ll check weight, whether baby looks dry or sleepy, and if your baby is having plenty of wet and poopy diapers. If you’re breastfeeding, we’ll ask how much and how often. We want to make sure baby is latched on properly and feeding well. If you’re giving formula, we want to know which formula, how much, how often, and how are you mixing it, because it’s very important to mix the formula exactly the way that it states on the container. We’ll also examine your baby from head to toe. We recheck all the things the doctor in the hospital checked. We look at their eyes, we listen to their lungs, we feel their bellies. We check their pulses and we look at their hips to make sure they’re not dislocated, which can sometimes happen after delivery. We also listen to baby’s heart because we can hear different sounds, like extra murmurs, that may not have been discovered at the hospital because a newborn’s circulation changes over time. That first visit is also a good time for us to find out everything that happened in the hospital, and if there are any concerns that a mom’s doctor might have about her—a full family history can help us know what to look for in baby. We also like to know where you live: If you’re in an apartment, what floor are you on? If you’re in a house, is there construction happening? Are there any pets or firearms in the house? Are there any smokers in the home? These are all things that can affect baby’s health. It’s normal to be emotional after giving birth (there are major hormonal shifts going on, after all), but we want to make sure it’s not something more serious. We’d be concerned if a parent is weepy throughout the visit or doesn’t seem to engage with the baby. Usually, at the first few newborn visits, the primary parent is accompanied by another adult. And the interaction between adults is important, too. If we notice a lot of stress, anger, tears, or resentment, or if the adults are not engaging with each other or the baby, we would want to address it because stress in a family affects babies, too. We also use a screening tool in the office that involves asking moms a series of questions and rating her answer on a scale of 1 (no problems) to 10 (postpartum depression). We’re here to support her and help her get resources if she needs help. The most important thing is to make and keep that first appointment, because babies and situations change quickly in the beginning. Sometimes parents don’t understand why it’s important, so we may not see their baby for three or four weeks. That’s a missed opportunity. We know how hard it is to get out of the house with a newborn. That first appointment with your pediatrician may be the first time you’re leaving your home with your baby, and that can be stressful. Plus, you may not be feeling well and if you’ve had a C-section, you’re still recovering from surgery. But don’t let that stop you. Ask for help if you need it. Let’s work together to get your baby on the right path to a long, healthy, happy life. Meet Dr. Minu George, pediatrician. Get ready for your first postpartum appointment with your OB/GYN. Read more stories about life after baby. Read from our collection of parenting stories on The Well.